The College’s Year 11 Information Technology students’ robots beat out machines from Pedare Christian College, Pembroke and Trinity College to take the title of VEX Robotics champions. 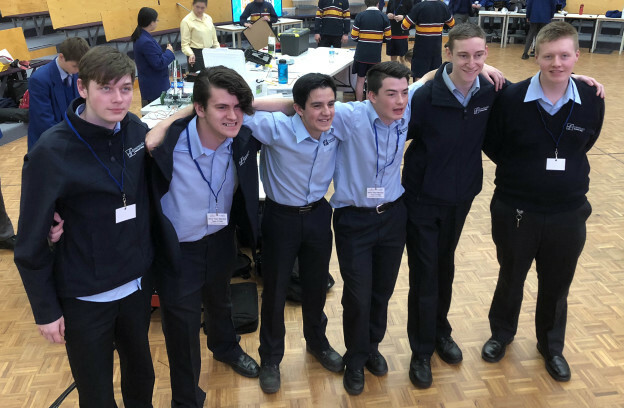 VEX Robotics run regular competitions around the world and the event on August 24th at Pedare College was the first in Adelaide. The win is even more impressive as StPatsTech only introduced its information technology program at the start of the year and the students had to build their robots from scratch. STEM teacher Bradley Sheridan said the students built their robots in teams. The robots then needed to be programmed and a controller also coded to talk to the machines. 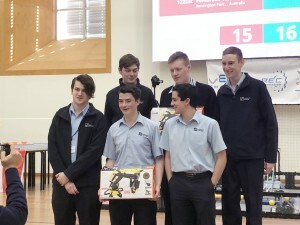 “We are immensely proud of the students taking out the inaugural title. Some of our competitors had extremely impressive robots and have been doing a robotics program for some years. To see students who are new to the robotics space come in and start from scratch and win is amazing. It was certainly tough competition,’’ Mr Sheridan said. The competition had 15 rounds with teams playing in alliances of two in two-minute rounds. Alliances can be with any other team in the competition. Teams have one operator and one spotter and must complete a series of tasks such as flipping disks, picking up balls and knocking flags. When the first and second ranked teams, Pembroke and Pedare Christian College respectively, chose to align for the finals, StPatsTech’s third placed Silver Bug Operatives chose to align with its fifth ranked team the Last Place Wonders. The first match of the final was declared a draw due to technical issues for one of the opponents and lead to a rematch, which StPatsTech won. The next competition will be held on September 21 at Pedare Christian College. This entry was posted in Latest News on 03/09/2018 by St Patrick's Technical College.